Irie girl here, senior pit bull with forelimb amp. We got her surgery done at the SPCA in Oakland and we decided to take her home after for overnight because it was out of our price range to take to ER after. (Was a rough night but we made it). She’s been doing really well eating, drinking, potty, and even walking. We just saw the vet this morning and she said the sutures look good and the redness and swelling is normal. However this saggy skin/fluid is new within the last few hours; her front leg did collapse and kinda hit her chin a little but I don’t think that was it. She also keeps trying to lay on her other side and causing stretching so we’re trying to keeep her on one side 😭. She just had a bout of diarrhea, I’m sure it’s from her meds, Gabapentin, Tramadol, and carpofen; we also got her Fentanyl patch removed this morning. Also How do I add photos ? Certainly sounds like a seroma , not cause for alarm, but click any seroma link for lots of photos and tips about what to look for in seromas gone bad. The seroma post includes links for treatment recommendations. Oftentimes the seroma will reabsorb, other times they are easily drained by your vet. Our good Admin Guy covered your quesrions. As noted, seromas are common. Can’t wait to see the avatar pic! Can’t wait to hear more about Irie.I A senior tripawd Pittie, doesn’t get any more loveable and smoochable than that! Yes, the first night as they come out of anesthesia , etc is a real rough time! Recovery is still rough for another week or two. For now, it’s all avout rest, resr, resr, SHORT potty breaks and then more rest. And face plants do happen on occasion with front leggers. Usually dogs don’t like to lay on their amp side because it hurts! But if that’s what she wants to do, no worries. If you have hardwood floors, make sure you put down non slip scatter rugs or rubber yoga mats. Yeah, the meds are probably upsetting her tummy. Just keep an eye on her poop. But YAY for poop!! Sometimes it takes days to poop. Drinking and peeing are important . Sometimes their appetites are off a bit, but try and get food in with their meds. The hospital meds usually wear off around day three or so. She may experience a bit of a crash, or what looks like a setback, it’s usually just those good meds being out of her system..
Stay connected and let us know how we can help, okau? Also, we have a TRIPAWDS HELPLINE staffed members who have been through this. Be sure and get some rest yourself…and eat chocolate!!! It helps! You need to add the full image URL using the Insert Image button (small mountain icon). If you need help, read these instructions for adding photos to forum posts or post in the Tech Support forum . You’re getting there! looks like you added an URL, but not one to a valid image file hosted online. 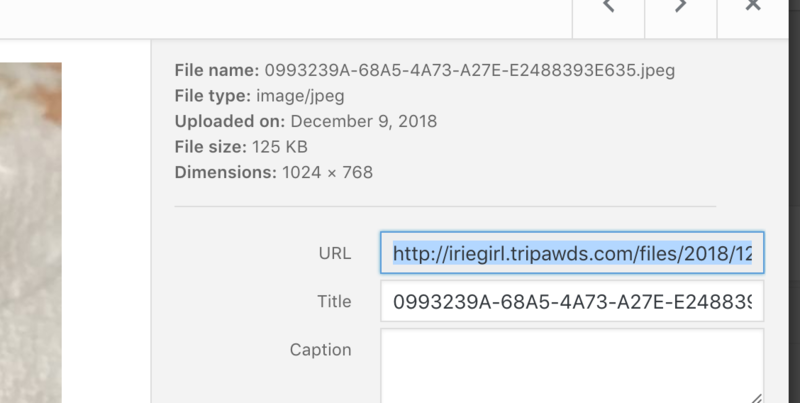 If you do not already share photos somewhere publicly online, you can start a free Tripawds blog anytime to host your images. Then, copy the link to the image file and paste it here in your forum post. We could also meet in the Tripawds Live Chat to help walk you through adding photos to forum posts . The photos are not working I tried uploaded them to a site as well, but it’s okay. Does anyone have tips for dealing with seroma drainage, we got a thunder shirt that has helped the bottom one stop leaking with pressure. But the corner part of incision is now leaking because the thunder shirt does not cover it. Should we just let it leak? We went to the vet yesterday and she said it was a seroma , it is normal, and to come back Monday. But I feel like it’s leaking a lot from that area and not clotting? Does anyone have photos on how to properly wrap it to apply pressure ? I would definitely allow it to leak as long as it’s more watery than bloody. A warm compress applied to the area will help the liquid flow out. As long as it’s not smelly or green, and the incision doesn’t look like it’s coming undone, it should be fine. If it builds up too much the seroma may require drainage at the vet clinic so you want to do all you can to encourage the liquid to come out. Sorry you are having trouble posting images to the Forums. Private message me if you would like help. So so now that leaking photo of the bottom stitch is not leaking and the dark sharpe corned is leaking about an inch wide. Same fluid color though. Thin watery, lighter red when you dab on gauze and doesn’t clot outside of the body. Not sure where the pictures are posted, but the links are not working. 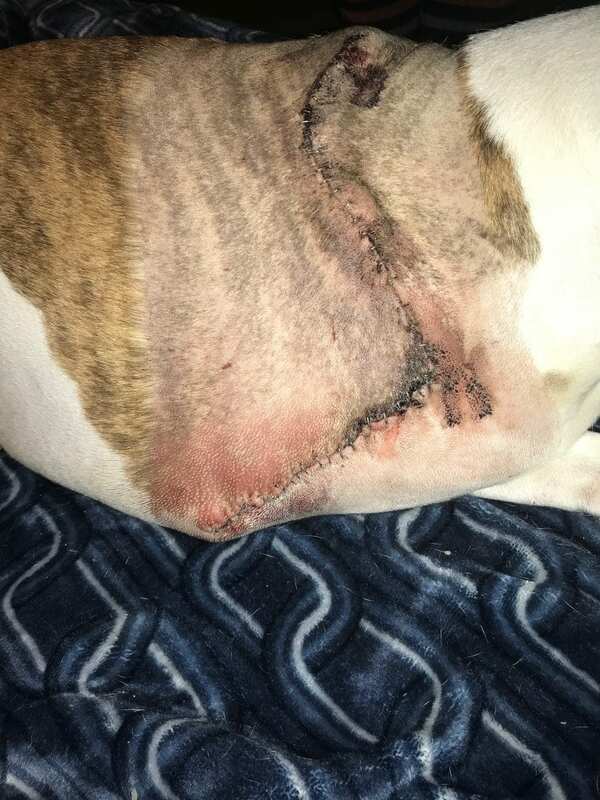 Are the staples/sutures still in place? Is there any swelling or warmth? Maybe you can try again to repost? Darn really, it’s showing on my end I uploaded them to a tri pawed blog, maybe I didn’t make it public :/. 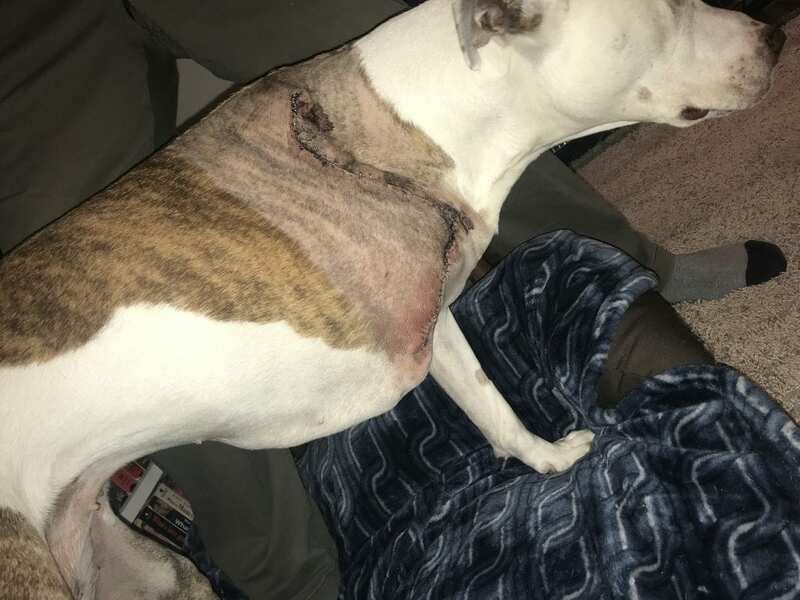 Yeah the staples are still attached not really swollen so much anymore with her thunder jacket. It’s warm but not any warmer then the rest of her body. Let me try again haha. FYI: Copy the URL for the actual photo image file from your Media Library, and paste that into your forum post. You pasted the link to edit the image in your Media Library, which only you have access to do, so nobody else could visit the links you used. We’ve fixed your post for you. See screenshot below showing how you get the image URL: 1. Upload photo to Library, 2. Click on a photo in your Library, 3. Copy the URL. PS: The leakage looks more like blood than typical seroma serum. If it is still seeping, you may want to have your vet check that out, or at least send them a photo ASAP. I don’t know what happened but now i can see them, yay! 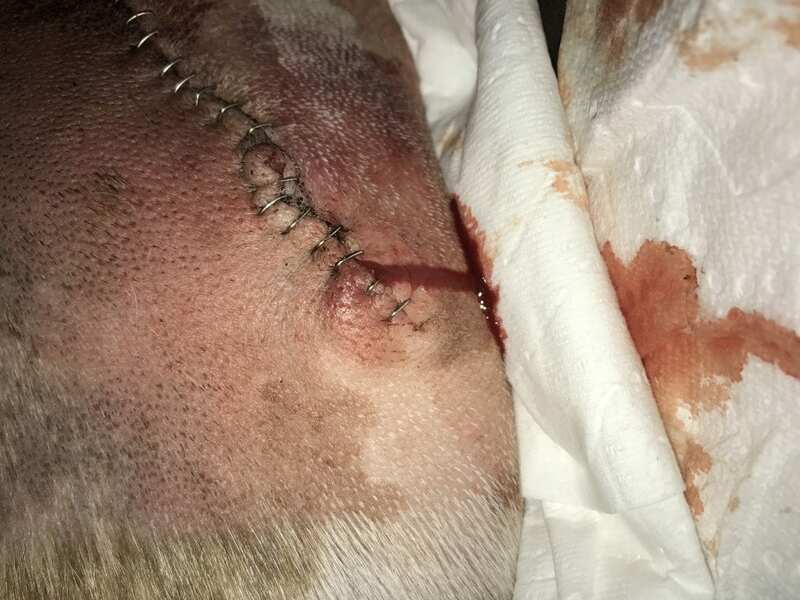 The bottom picture looks like the bottom area around the incision is a little puffy. I am not a vet, and i don’t play one on tv, lol. If that is the area that has stopped actively leaking, I would be concerned about the fluid buildup (seroma ). I totally agree that you should get in touch with your vet. Best case scenario they tell you it’s ok, and i would rather see that then waiting and finding out you should have gone in. If fluid is building and unable to drain it can get ugly. Staying on top of it is the absolutely best thing you can do to help the recovery process.